Perfect flooring, extra cushioning, dual color interlocking mat, both side usable, anti skid design are the main features of our Interlocking Mats. Easy to assemble & dissemble is the popular specification of our karate mat, which is highly appreciated in market. 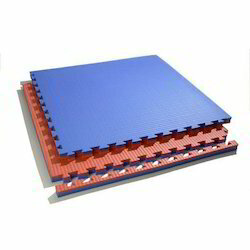 Our Karate Mat is made up of high density foam with interlocked edges provides better cushioning, which prevent all major body strain during karate.